Management of clinicians can be extremely challenging for clinical managers. Many managers have no formal training in this area, and have difficulty critiquing colleagues and dealing with people resistant to change. 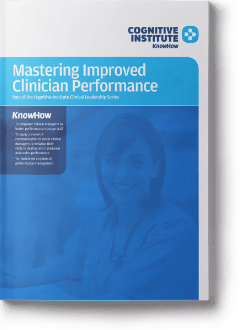 The Mastering Improved Clinician Performance workshop provides clinical managers with the insights and skills to successfully conduct performance appraisals and coach clinicians to improved performance. The workshop empowers clinical managers to better manage staff performance and apply a model of communication to assist them to enhance their skills in dealing with resistance. They will be able to implement a system of performance management with interpersonal skills performance acting as a template. 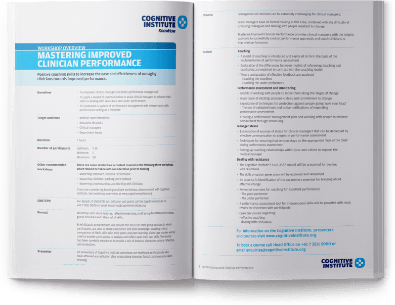 Positive coaching skills to increase the ease and effectiveness of managing clinicians towards improved performance.